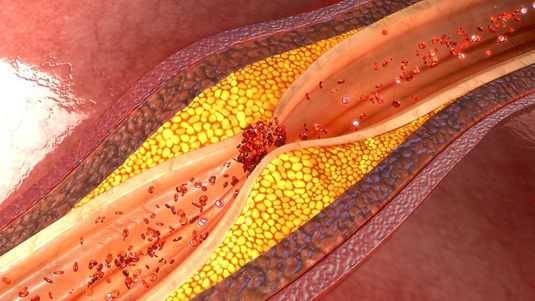 The formation of blood clots in atherosclerotic arteries results in myocardial infarction and stroke. New research at LMU now demonstrates that low doses of agents developed to treat leukemia can selectively inhibit atherosclerotic plaque-induced thrombus formation. The rupture or erosion of atherosclerotic deposits (plaques) piling up in the inner layer of arteries exposes material to the blood stream that stimulates the adhesion and aggregation of blood platelets ( and the subsequent formation of thrombi) which can precipitate heart attacks and ischemic strokes. Several proteins play key roles in this complex process, including receptors on the platelet surface that bind to plaque collagens. Professor Wolfgang Siess and his colleagues at LMU‘s Institute for the Prophylaxis and Epidemiology of Cardiovascular Diseases have now shown that drugs which are used for the treatment of certain forms of leukemia specifically inhibit the formation of atherosclerotic plaque-triggered thrombus formation – and they do so more effectively than the agents currently employed for this purpose. Their findings appear in the journal Blood. Two receptors found on platelet, glycoproteins Ib and VI, are critically involved in initiating the formation of plaque-induced thrombi. Earlier work had shown that antibodies against these receptors reduce thrombus formation triggered by atherosclerotic plaques more effectively than do standard anti-platelet therapies. “Since signal transmission by these receptors is essential for platelet activation by plaques, we suspected that inhibition of the signal pathway downstream of these receptors should also effectively suppress thrombus formation,” Siess explains. The LMU researchers have now confirmed this hypothesis by inhibiting an enzyme known as Bruton’s tyrosine kinase (Btk). When glycoprotein Ib or VI bind to their respective ligands, Btk gets activated and triggers a signal cascade that activates platelets. Oral intake of pharmacological inhibitors of Btk, such as ibrutinib, irreversibly blocks this process. Ibrutinib is already in clinical use for the treatment of chronic lymphocytic leukemia , and recently an even more selective Btk inhibitor (acalabrutinib) has been approved by the FDA to combat other B-cell malignancies.